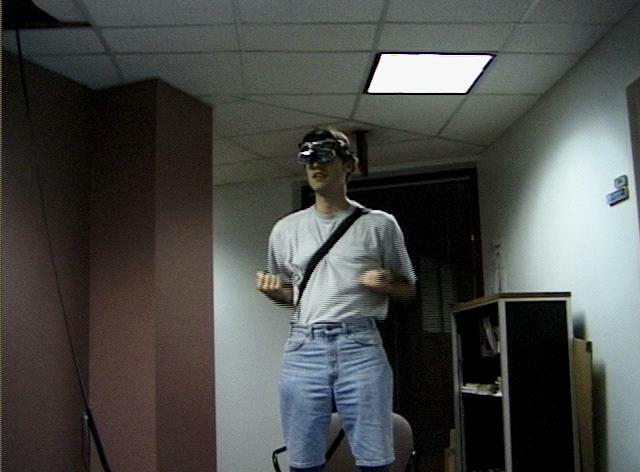 During a late night brainstorming session in April 1999, Prof. Thad Starner and I came to the mutual conclusion that it was feasible to prototype a compelling augmented reality gaming experience. The game could serve as a platform to illustrate the power of integrating the capabilities of a wearable computer, gesture recognition software, and remote collaboration techniques. Georgia Tech graduate students Bastian Leibe and Brad Singletary agreed. Together, we began an ambitious effort to develop a demonstration system . 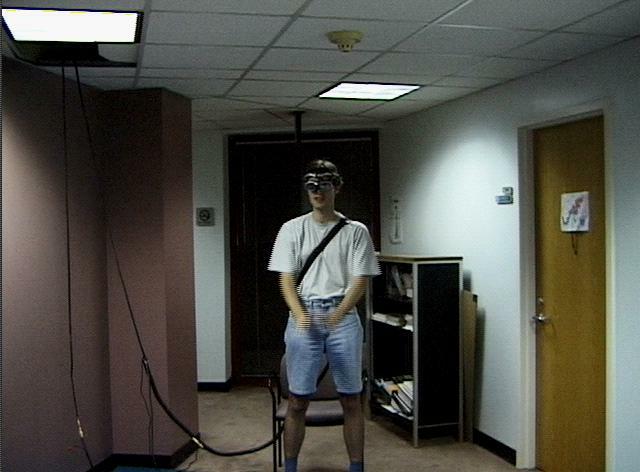 In the final prototype, a mobile player was equipped with a wearable computer, headphones, and a see-through head mounted display. When standing in a hallway, the player would see virtual flying blocks which represented attacking monsters. The player could counterattack with verbal commands and physical gestures styled as martial arts moves. 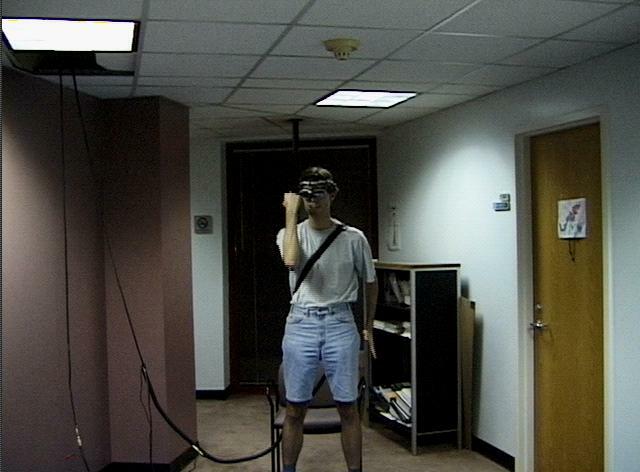 Cameras mounted on the player were used to recognize these movements. The player’s opponent was a “gamemaster” controlling a “perceptive workbench“. This device uses infrared cameras to recognize object movement and hand gestures on its surface. The gamemaster would attack the mobile player by moving plastic models of the monsters on the workbench. Kent Lyons and Maribeth Gandy joined the development team as the effort progressed throughout 1999. This project was featured as a sidebar in the May/June 2000 issue of IEEE Computer Graphics and Applications. A .pdf file of this sidebar can be downloaded here. An extensive technical description of WARPING was presented at the 2000 International Conference on Intelligent User Interfaces (IUI2000). Starner, Thad, Bastian Leibe, Brad Singletary, and Jarrell Pair. 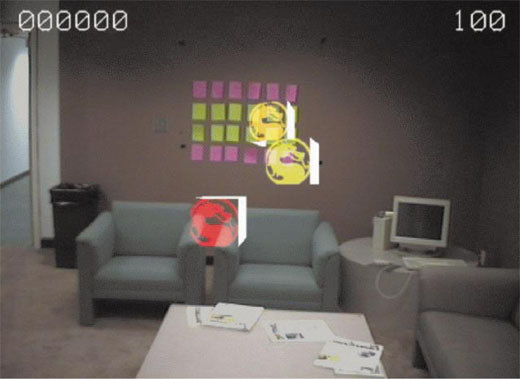 “MIND-WARPING: Towards Creating a Compelling Collaborative Augmented Reality Game.” Proceedings of the 2000 International Conference on Intelligent User Interfaces (IUI2000). ACM Press. January 2000. pp. 256-259. Player view: The mobile player sees flying blocks superimposed on the real world. Players can defend themselves by physically performing martial arts moves seen below. Gamemaster control surface: Remote gamemasters control the monsters (blocks) attacking the mobile user. 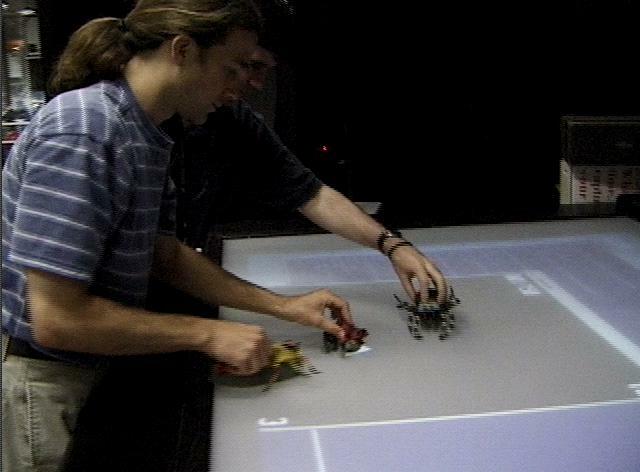 Attacks are initiated by moving plastic models of the monsters on a perceptive workbench.